St. Joseph School families provide their own transportation to and from school. The school's system for morning drop-off and afternoon pick-up ensures the safest procedures for our students. The safety of our school community is of primary importance. Please drive slowly and follow the instructions of the teachers and directions in these guidelines. Safety Patrol members are responsible for helping provide a safe parking lot. Please cooperate with them at all times. We ask that all drivers always maintain a very minimal speed (no more than 5 MPH) when driving on the parish property. Students feel that this is a “safe space” and do not watch out for moving vehicles as they should. Animals of any type are not permitted outside of cars. Students should arrive at school between 7:35 AM and 8:00 AM and report to their classrooms. ONLY Pre-K students and their siblings are to enter using the kitchen door. 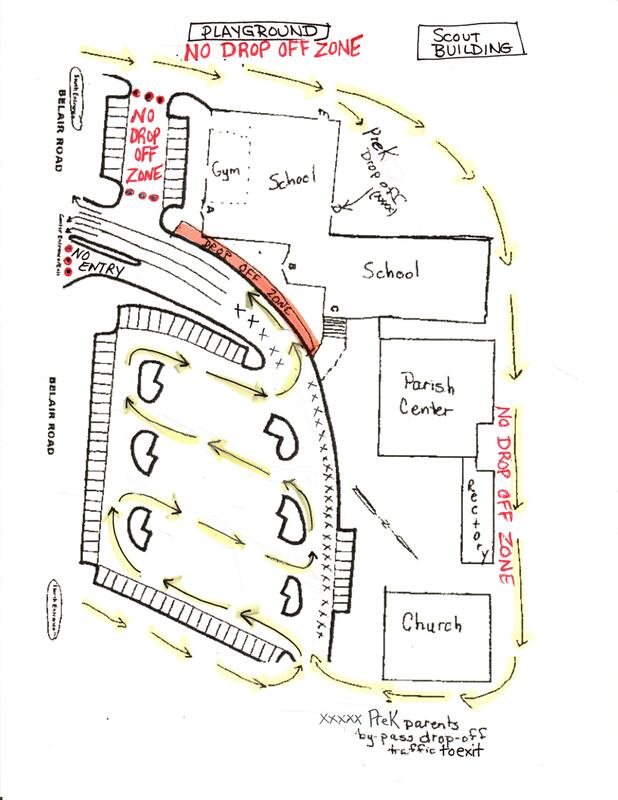 ALL other students in grades K-8 are dropped off in the “Drop Off Zone” along the front curb and enter at the front doors near the office. Students arriving prior to 7:35 AM wait at the school doors. No supervision is available until 7:35 AM. Students coming for Coach Class report to the appropriate classroom at 7:35 AM, not before. Please check the map for morning traffic patterns that protect the safety of our students and the discharge of passengers. 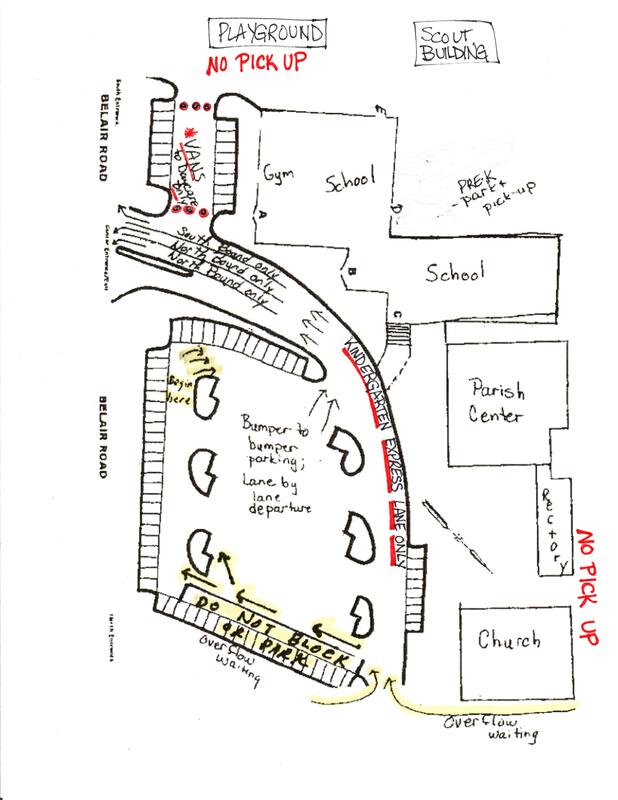 Also note the areas where vehicles may park before school, if necessary. Our one-way traffic patterns are for the protection of everyone. Please adhere to them. Our dismissal pattern does work!! Your patience is key to the safety of our students during every dismissal. Do not block fire lanes or the north driveway (extending to Belair Rd. near the Church). No drivers are to park in front of the building. If a problem persists, the principal will be notified. Again check the map for dismissal traffic patterns. All lanes exit at the traffic signal. Please park bumper to bumper, but no parking lanes should extend back to the driveways, cones or fences so that other cars may enter the main lot. This responsibility lies solely with you, our parents and drivers, as teachers cannot assume parking lot duties until after the 3:15 PM bell. Your help is most important at this time of each day. Young students are crossing the lots on all sides of the building including the south side as they travel to the Scout Building for after-school care. All students are thinking of two things at dismissal time: Where is my driver? Where am I going? They are not watching for cars. Only you can help us keep our lots safe. Please follow the directions of the teachers and/or safeties. We appreciate your help greatly. Students whose rides are not in the main lot stay in an area near the school exits. Students may NOT leave that area until the initial traffic has moved out and traffic comes to a complete stop. We ask that drivers do not come and take students from this area once traffic has started moving. They will NOT be permitted to leave. Again, safety for our children is the primary concern. On days of inclement weather, students will stay inside the school building if their driver is not in the main lot area. Students can view the parking lot from inside. We ask that you pull up in the lot and give them a moment or two to come out. then $5 for every 5 minutes after that. © 2019 St. Joseph School - Fullerton.